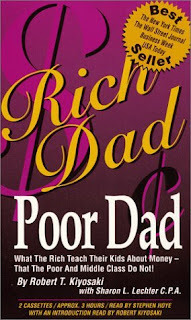 The book this week was Rich Dad Poor Dad by Robert Kiyosaki. 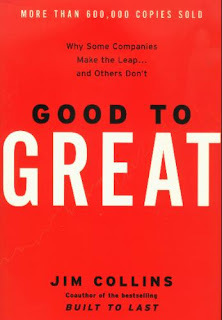 Amazing book. Kiyosaki's title comes from his upbringing. He had his biological father, a PhD educated professor, and his best friend's father, a serial entrepreneur. The first dad was the poor dad and the second was the rich. His poor father told him to work hard and get a good education and he would get a good job to take care of him. His rich father told him to go against the norms of society and gain financial independence. The first step to gaining your financial independence is learning how to apply accounting concepts to your personal life. It's real simple and Kiyosaki says the reason most adults don't catch on is because it's too simple. But the trick is all about cashflow. You have to make sure your assets are greater than your expenses. 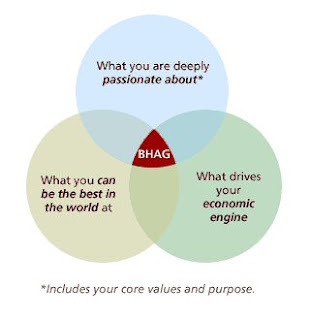 The hardest part about this is determining what an asset is. An asset is anything that is going to perpetually give you income: stocks, bonds, notes, some real estate, etc. Most people don't worry about making the assets greater than their expenses and for those people... it doesn't matter how much money you give them, they will always be in over their head just scratching to pay off bills. Kiyosaki's poor father was making a great salary, but he didn't know how to regulate his cashflow so he was always over his head. One issue in the book, which is brought up quite often, is that going to school and getting a good education is not enough to get everything you want. If you go to school, pass you classes with straight As and get into a high paying job... The government is still going to reach into your check before you can even spend a cent and tax you 40-50%. That means that you work your new job out of school and the first 4 to 5 months you are working goes straight to the government. Doesn't seem fair. On the other hand, Kiyosaki points out what the rich do. They use corporations to protect their money from the government. A loop hole that politicians put into the books to help themselves (the rich). You see, when you have a corporation you don't get taxed until after you have spent all your money. That means that instead of the average American who is getting paid $30,000 a year, who gets 40% taken right off the top, who can spend $18,000 on their needs and wants. A corporation that makes $30,000 a year and can spend as much of that $30,000 on company cars, dinners with clients, company housing and then gets taxed on what is left after those purchases. Sounds a lot better... and anyone can start a corporation. Kiyosaki was taught at a early age how to play the game by his rich dad. When he grew up he worked at a job just like everyone else, at Xerox. While he was at Xerox he started a Real Estate Holding Company and while he worked his day-job he flipped houses on the side. He had the best of both worlds. So in case you were wondering, you don't have to quit your day-job to be an entrepreneur. You may call me naive, but I honestly do think that every single person has what it takes to be a millionaire. They just let fear and cynicism control them. They fear losing their money and they are a cynic of anyone that is trying to do something great... "That will never work"... I cringe at these words and I have done my best to avoid people that spout these words because in the words of Miguel de Cervantes Saavedra "Tell me what company you keep and I'll tell you what you are." I do think you can do it. And I think if you are willing to put yourself out there, your million dollar dream is not far away. Read this book, it's an eye opener. If you have any questions on the book don't hesitate to ask me a question. I would be more than happy to help anyone that needs it. This video is very well made and explains how money works. I know its long, but watching this will open your eyes to how we got where we are today. 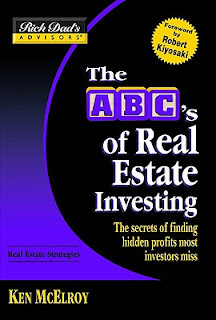 The book this week was The ABC's of Real Estate Investing by Ken McElroy. I was introduced to this book by a friend of mine. He has become quite the adviser on the subject of Real Estate Investing, starting his own Investment Group LLC at the early age of 22. McElroy's book is slow starting, (which is expected with any book that has "The ABC's" in the title) but it really picks up after a few chapters. 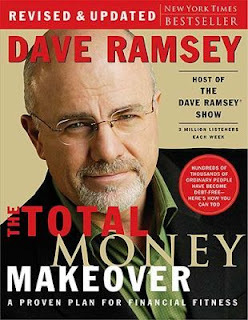 I know that after reading this book I could make six figures in the business of real estate investing in 5 years or less. The first step is exactly that: Making a goal for yourself. Tell yourself that you want to make more than $100,000 annually in 5 years in multi-unit real estate investing. The goal you set for yourself has to measurable- "over $100,000", Time based- "5 years", and specific- "multi-unit real estate investing." After you have your property you will need to decide if you are going to be a the property manager- the person that handles the landlord duties- or are you going to outsource that job to property management company. I recommend outsourcing for any property over 8 units. Let someone else handle the rent checks, leaks, broken appliances, flooding, evictions, background checks, criminal checks and the list goes on. Outsourcing this job will allow you to work on researching other properties or continuing career goals. Property management companies will charge between 8% and 14% depending on the number of units and the company. However, remember that like all things, you get what you pay for. As you venture into this new world of Real Estate Investing you may start small with a duplex or a small apartment complex. If you follow the guidelines laid out in this book you will have a steady cash flow to reinvest in new larger properties. The goal that I previously outlined in this review is not far-fetched. If you are motivated, put the excuses aside, believe in yourself, and really go for it you can reach this goal. In the current economy you have a goldmine of opportunity. Go do some research and put yourself out there. Interest rates are low and everybody is selling. Its a buyer's market, so take advantage! I think this book is good for anyone that has ever thought about investing in property to supplement their income, but never really knew what steps to take. If you have any questions on the book don't hesitate to ask me a question. I would be more than happy to help anyone that needs it.